Both Apple and Samsung use in-house chipsets (though the Galaxy Alpha also comes in a Snapdragon 801 version), while Sony uses Qualcomm offerings for most of its lineup. Apple bought a CPU design company and has been using custom cores ever since. The latest is called Cyclone, which debuted with the iPhone 5s and the iPhone 6 uses a slightly tweaked version. Apple's CPUs are only dual-cores and run at a low frequency but they are closer to an Intel core than the usual ARM cores. The company claims a 20% speed improvement over the last generation, which was competitive with the quad-core Kraits of the time. The other half of the Apple A8 chipset comes from Imagination, the PowerVR GX6450. It's as much as 50% faster than the GPU in the A7 chipset but the increased resolution of the new, bigger screen offsets most of that. Samsung's custom chipsets are based on standard ARM Cortex cores, four of A15 and four of A7 in the case of the Samsung Galaxy alpha. The chipset is SMP-enabled, meaning it can run all eight cores at once, subject to thermal restraints. The GPU in the Exynos 5430 chipset also comes from ARM's labs, A Mali-T628 MP6. Snapdragon 801 is at the heart of the Sony Xperia Z3 Compact and the alternative Galaxy Alpha version. They have four Krait 400 cores paired with Adreno 330, both coming from Qualcomm. It's a tried and tested chipset, offering great performance to the many high-end Androids out there. Geekbench 3 finds a good use for the many cores of the Samsung Galaxy Alpha chipset and puts it on top with a small margin but having fewer cores certainly didn't hurt the iPhone 6. In fact, it tops the Basemark OS II chart. This benchmark doesn't appreciate Exynos 5430 nearly as much as Geekbench and places the Galaxy Alpha last. Meanwhile the Sony Xperia Z3 Compact shows a middle of the road performance - you won't be short on CPU power, but you can't brag about benchmark scores to your friends either. Apple has stuck with PowerVR GPUs through the years and they haven't let Cupertino down. The latest generation is very impressive and manages to top the charts even in the 1080p off-screen tests, even though none of the three phones ahs the screen to show a 1080p image. More importantly, the iPhone 6 hits a solid 30fps on the heavy GFX 3.0 Manhattan benchmark, while the two Adenoids don't quite make it to the 30fps mark. Benchmarks are typically more demanding than games (it's a form of future-proofing the benchmark) but even so iOS devs can squeeze out a bit more out of the hardware. They already start off with an advantage over their Android counterparts since Apple has only a few GPU and screen resolution targets, while Android games need to serve a much wider and diverse audience. In the battle between Mali-T628 MP6 and Adreno 330, the Mali-powered Galaxy Alpha beats the Adreno-running Xperia Z3 Compact by a small but not insignificant margin. Note that different game engines behave differently on various GPU architectures and the Basemark X test prefers running on Adreno rather than Mali. The PowerVR-based iPhone stays on top though, with a healthy margin to boot. Samsung tunes the stock Android browser to perform as well, which shows in the speed advantage over the Chrome-running Xperia Z3 Compact. Chrome is no slouch though and pays off with slightly faster page rendering, but the gap to the iPhone is truly impressive. Winner: Apple iPhone 6. The iPhone is no underdog - casual users may be misled by CPU core count but the Apple handset won almost all of the challenges here. Apps, games and websites have processing power to spare and can deliver a flawless experience. 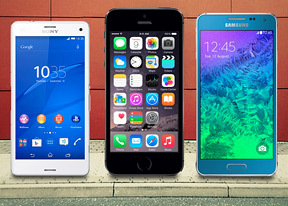 Runner-up: Samsung Galaxy Alpha. The Exynos 5430 chipset beat out Snapdragon 801 in certain benchmarks and you can try and get an S801 Galaxy Alpha too. Not that you'll see much difference in performance. Neither is as fast as the Apple A8 though. Third place: Sony Xperia Z3 Compact. Snapdragon 801 is certainly fast enough for daily use - apps, gaming and browsing - but the iPhone will be noticeably faster in some scenarios.